Specimen collection number PTM 459 in the UBC Herbarium Algae Database. Search the collection number in the database for more information on this specimen, or search the species for further occurrences. Images courtesy of Sandra Lindstrom. ​This delicate brown seaweed is characterized by flattened, dichotomously branched blades that can reach 40 cm in length. Blades are dark brown at the base, lighten towards the rounded branch tips, and are typically 1 to 1.5 cm wide. Small teeth can be found on the margins of branches. Branches lack midribs. Male and female reproductive structures are found on separate plants, and this species also reproduces asexually via horizontally creeping branches called stolons. Mermaid’s gloves can be found growing on rocks in the low intertidal zone to depths of 30 m. Its range extends from Langara Island (north end of Haida Gwaii) south to Baja California. It can also be found in Japan. 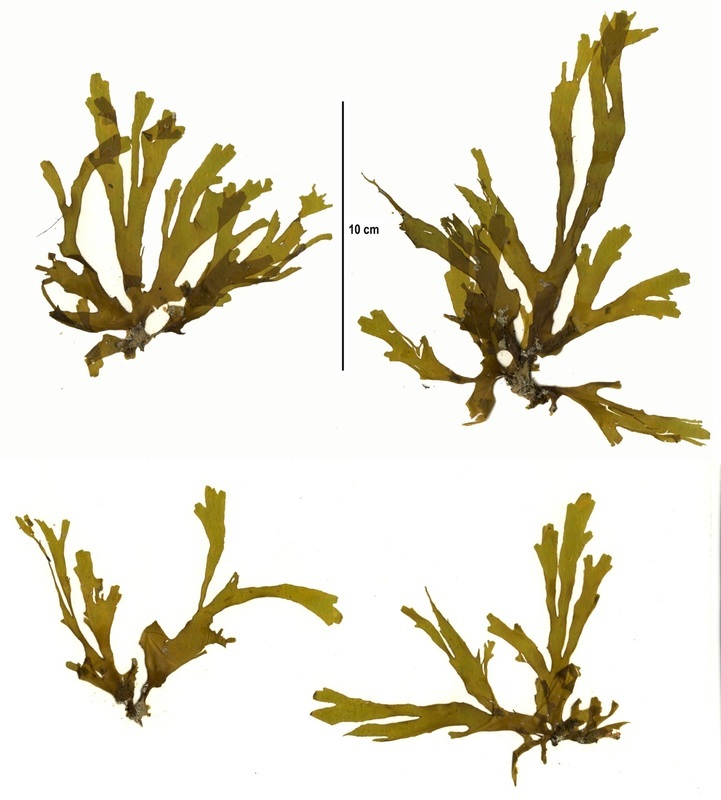 The specimens depicted here were collected from West Beach, Calvert Island at a depth of approximately 6 m. Late winter and early spring are seasons when this species is more conspicuous. Lindberg, M. and Lindstrom, S. (2010). Dictyota binghamiae. Seaweeds of Alaska. Accessed 2016-04-06. O'Clair, R. and Lindstrom, S. Dictyota binghamiae J. Agardh. In Klinkenberg, Brian. (Ed.). E-Flora BC: Electronic Atlas of the Plants of British Columbia. Lab for Advanced Spatial Analysis, Department of Geography, University of British Columbia, Vancouver. Accessed 2016-04-06.